By Garett Sloane . Published on February 04, 2019. Snopes couldn't come to an agreement with Facebook, citing a communication gap over its fact-checking plans. Facebook is breaking up with one of its fact-checking partners, raising fresh questions about the social network's commitment to fighting disinformation. Last week, the fact-checking site Snopes revealed that it would not stay on with the program this year; meanwhile The Associated Press is still evaluating its commitment. The program started in 2016 when Facebook tapped third-party fact-checkers to help weed out false news in an effort to prevent the type of disinformation campaigns that marred the 2016 U.S. presidential election. The fact-checkers evaluate the veracity of claims made on Facebook, which are called to their attention in a database of flagged posts. People and machine learning algorithms can identify potentially troublesome posts, or the fact-checkers themselves can pick claims they want debunk. When a post is found to be misleading, Facebook lowers the frequency with which people see it. Snopes declined to sign on for the yearly commitment to be part of the program in 2019, and decided to inform the public so there was no confusion about its participation going forward. 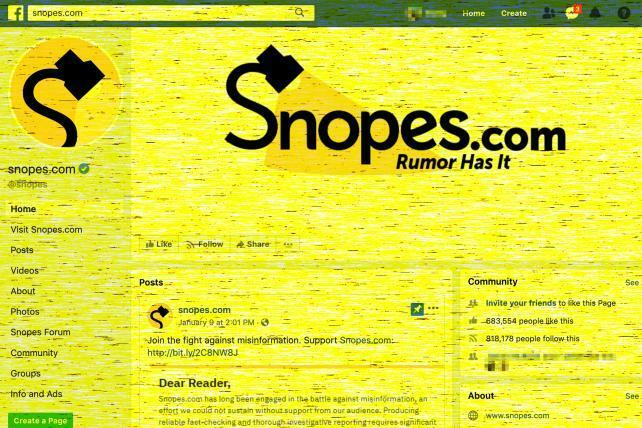 Though Snopes left the door open to working with Facebook in the future, there were complications preventing a deal this year, according to Snopes CEO David Mikkelson. "The literal reason we're no longer part of the partnership is because we couldn't agree on renewal terms," Mikkelson says, "and Facebook's lack of responsiveness eliminated any possibility of further negotiation." Facebook pays the fact-checkers, depending on how many posts they rate and other factors. Some participants have publicly disclosed how much they get from Facebook. In some case, it's upwards of $300,000 a year. At the end of last year, a Guardian report said the fact-checking initiative was in disarray. The report claimed, among other things, that Facebook pushed fact-checkers to prioritize misinformation that affected advertisers. That claim, which came from a former editor at Snopes, does not stand up to scrutiny. "The quoted person was not involved in the day-to-day management of the Facebook fact-checking partnership during her employment at Snopes," says Mikkelson, "and her comments are not reflective of this organization's viewpoint or experience." It's hard to say what posts are lies, what posts are just wrong and what posts are just jokes, Mikkelson says. Facebook has struggled with the contours of what constitutes disinformation ever since it began the program. For instance, there are websites that let people generate "fake news" and share them with Facebook, presumably just for fun. These "prank" sites can trip up the fact-checked. Satire is also similarly complicated. According to reports, fact-checkers are also concerned the program can't keep up with the volume of misinformation. In October, The Wall Street Journal reported that some fact-checkers say they only handle one claim a day. The limited workload has led to claims that Facebook is not serious about purging disinformation. Facebook understands Snopes' decision to drop out of the program, and said it plans to add new partners and languages, according to a Facebook spokeswoman. "We value the work that Snopes has done, and respect their decision as an independent business," she said in an e-mail statement. "Fighting misinformation takes a multi-pronged approach from across the industry. We are committed to fighting this through many tactics, and the work that third-party fact-checkers do is a valued and important piece of this effort." Alexios Mantzarlis, director of the International Fact-Checking Network, which works with Facebook to vet participants, says there are flaws with the program but not widespread dissatisfaction. The fact-checking group has surveyed the members and found the biggest problem was that Facebook has not been clear about the impact of the program, but no one has complained about not getting paid enough, according to Mantzarlis. "It looks like the major questions are more about transparency and how much the company is sharing with the public about the project rather than financials," Mantzarlis says.